Thank you to all who attended the third community meeting hosted by the Francisco Park Conservancy and the San Francisco Recreation & Park Department on January 11! We had a fantastic turnout and we were thrilled to see so much enthusiasm for the park. We began the meeting with a quick word from Supervisor Mark Farrell, and a presentation by Leslie Alspach, Board President for the Francisco Park Conservancy, and Richard Parker of 450 Architects. We also heard from Dana Ketcham, Director of Permits and Property Management for SF’s Recreation & Park Department (RPD). The project team presented feedback from the online design survey and previous community meetings, shared the updated park designs, and discussed the proposed park rules and park name. To see the full meeting presentation, click here. 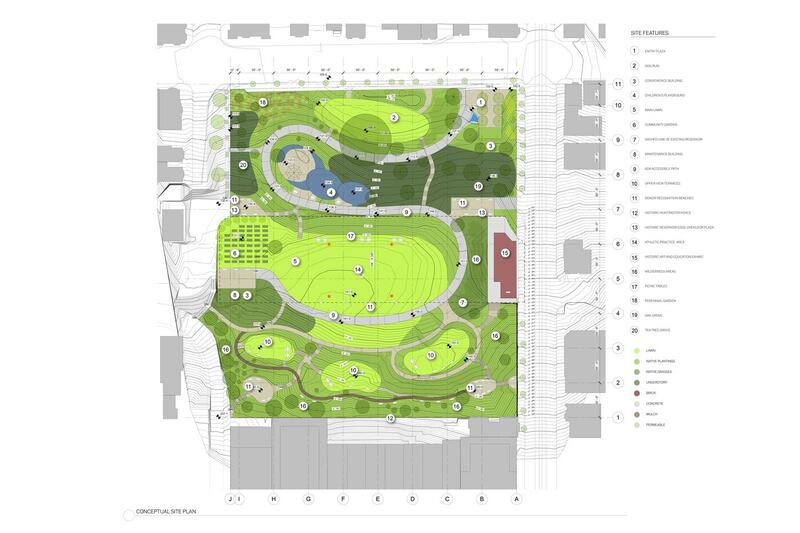 The meeting then broke into small group discussions, where attendees could see detailed designs of various park elements, discuss ideas with the design team, and leave their comments on feedback boards. To see additional photos of the breakout groups and the completed feedback boards, click here. The meeting concluded with a question & answer session, during which topics including the park’s safety measures, a possible athletic practice area, and potential vegetation were discussed. Meeting attendees were invited to fill out the online design survey, comment cards, and continue to post feedback on the feedback boards. To see a summary of the feedback received at meeting #3, click here. As we discussed at Meeting #3, RPD has deemed this site inappropriate for a full-size soccer field. However, in response to community feedback, the park design team is working to adjust the open space area so it may accommodate an athletic practice area, which could be used for soccer practices for players of all ages. We will be co-hosting a fourth community meeting with RPD in the coming weeks to update the public on feedback we have received since our formal outreach process commenced in September 2016. We will update the website and send invitations as soon as the date and location are finalized. In the meantime, please continue to engage with us by filling out the online design survey, which remains live, and contact us at info@franciscopark.org with any additional thoughts, feedback, or questions. Thank you for your continued support for Francisco Park!